I love it when a project comes together! Last month I was fortunate enough to have won a Gypsy courtesy of Provo Craft and Michele Kovack's wonderful blog. Michele is a consummate papercrafter, and her designs and attention to detail are always inspiring. I really have enjoyed getting to know my Gypsy over the past few weeks, planning projects while waiting at parent pick up at school, and exploring the features on my cartridges. A few of the functions I like best about the Gypsy is the ability to work with several cartridges at once on the same project, the ability to search for images in the cartridge library (even ones you don't own), and the ability to see the exact measurements (height and width) of the images you are using. 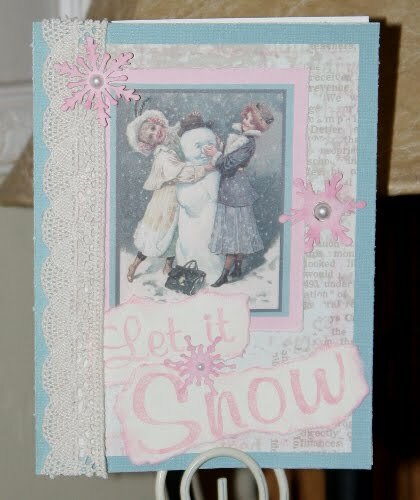 This week, I am hosting the Crafty Secrets member forum at Splitcoast Stampers. We are playing with shapes this week - die cuts, punches, templates, stencils, etc. For my Let It Snow sample card, I cut various snowflakes on my Cricut Expression using the Winter Woodland cartridge. I designed the card below on my Gypsy while waiting at parent pick up at my kids' school. I made several of these for my daughter as birthday thank yous for relatives. 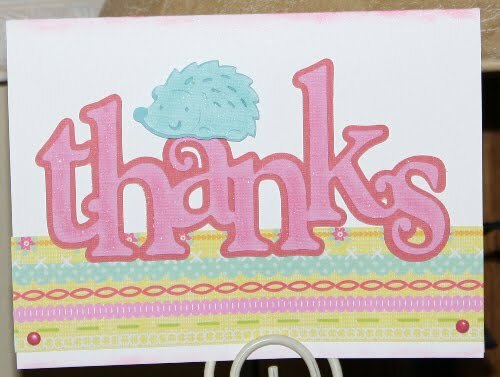 I love the simple, bold design on this with the bright colors and sweet little hedgie - as my dh said, "It's so very 'Shannon!'" Accessories - brads - Making Memories; Pop Dots; pearlescent chalk - Pebbles Inc.